The Morningstar solar controller stores about 200 days of data. I plan to go up often enough to download the data and store it so that we can analyze the data. The documentation page gives information about the controller and data that it stores. I an providing the raw data files here. I will also create some plots that I think might be interesting. The fields are enclosed in double quotes and separated by commas. Some of the quoted fields can contain commas so you need to pay attention to this if you remove the quotes. The date information is based on the date that the data is downloaded, according to the laptop clock. The controller does record times that it has power removed. This can be seen in the initial data file that was extracted. The controller was first used in my back yard for testing and then sat powered off for a couple weeks before it was moved to the repeater site. However the dates show no gap but do indicate a power cycle. The controller needs to drive the batteries to a specific voltage before time in the absorption or float stages will be recorded. This means that if the batteries are low it is possible for charging to take place without showing any time in these stages. If time is shown in the float stage then we were able to fully charge the batteries and now additional charging was needed. I may add some data plots in the future as time permits. 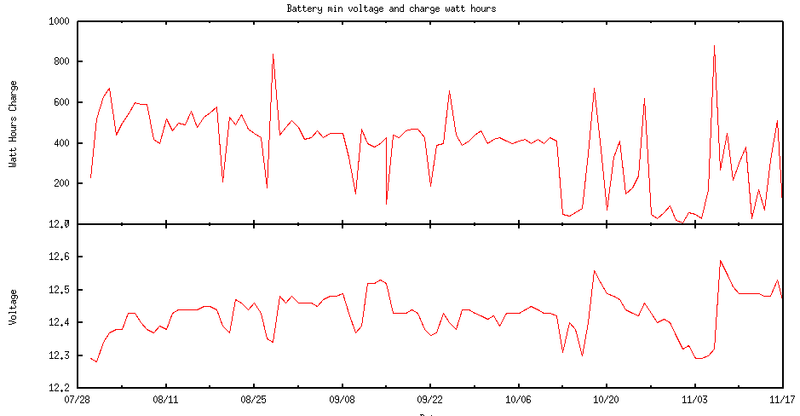 Meanwhile here is a plot showing the daily minium battery voltage and the totall watt hours of charging given.